A whole bag of these little fruit flavored marshmallows cost me 88 cents! 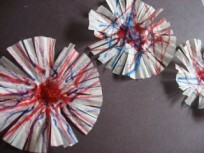 Add some markers, paper, and glue and you have a matching rainbow craft for kids and snack. Now that is frugal. I want to warn you though, you may think you aren’t going to snack on these sickly sweet little things but they will call to you from the cupboard. Make a big rainbow or some rice crispy squares if you want to avoid them. Gather your materials. 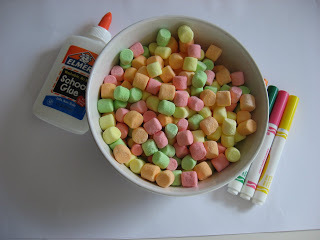 You will need some multicolored mini marshmallows, glue, markers, and paper. 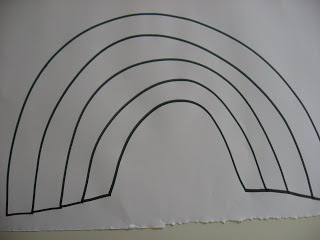 Start by drawing a rainbow on the paper. 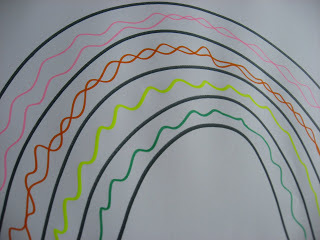 Next, I added some squiggles of color in the rainbow to act as a guide. Older children can skip this step. Add your marshmallows. I added some to get my son started, then he began matching them to the colors of the rainbow. When he started to lose some steam I asked him if he could find specific colors, then praised him when he did and helped him fill in his colors. A little praise and teamwork go so so far at this age it’s amazing. 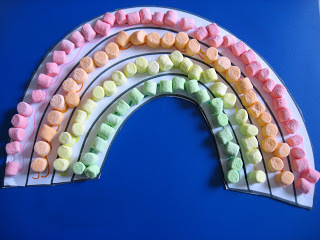 If they don’t want help but the rainbow is too big, put it away for a day or two and bring it back out, the marshmallows aren’t really food and will stay ok for days. Let dry- it takes a while but it will dry! Cut out the rainbow craft. 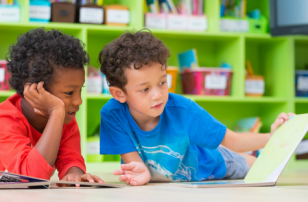 For kids that are younger, you may need to help. 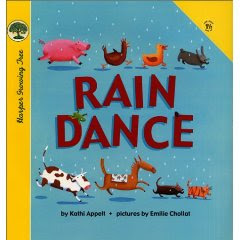 “Rain Dance” by Kathi Appelt is a simple little counting book with bog numbers and fantastic simple pictures of the animals on a farm in the rain. This is a great example of a book made for a young toddler. My son loves it because he can read the numbers and announce the animals, even though he can’t read the text he has been “reading” it to himself multiple times a day complete with clapping at the end. ” Duckie’s Rainbow” by Frances Barry is a clever little book. You walk with her as she passes things like a yellow cornfield and blue pond until the pages above create a rainbow. I love the idea but reading it with my son all he wanted to do was turn the pages as quickly as he could to make the rainbow. Not a big deal in reality but this would make a better story time book than bedtime for that reason. 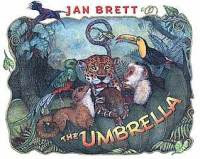 “The Umbrella” by Jan Brett is another fantastic book by this very talented author and illustrator. A little boy goes off into the jungle in the rain to see if he can find animals. He puts down his umbrella to climb a tree. While he keeps climbing higher and higher all the animals he wanted to see, fight for a spot in his umbrella that ends up floating down the river. The story is adorable and layered for different ages, and the illustrations will captivate you! 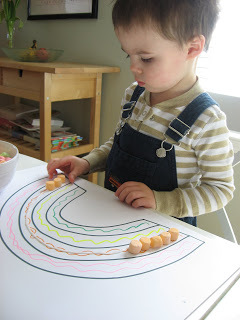 Want more great ideas for preschool activities like this rainbow craft for kids? 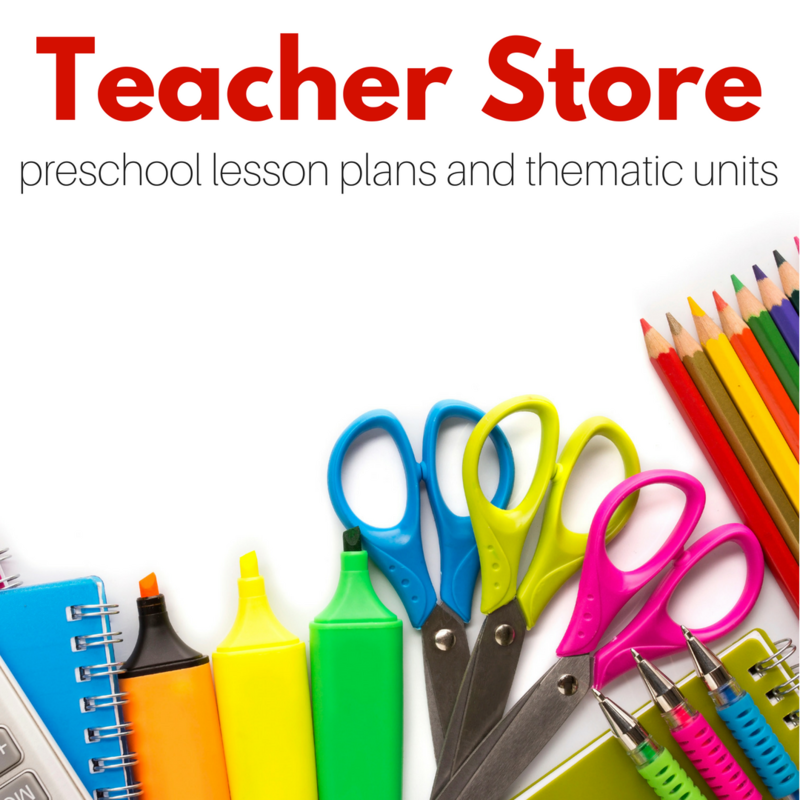 Check out our Build Preschool Thematic Curriculum Units! Previous Post: Computer Issues Repost ! We will be doing this tomarro! I have a huge bag of theese in the cupboard! Thanks!!! Yet another brilliant idea!!!! LOVE everything you do… can’t wait to whip up this sweet treat— fun fun fun. Another wonderful idea…I love how cheap everything is too. Thank you again!!! Wow – I didn’t even know they made multicolored marshmallows! 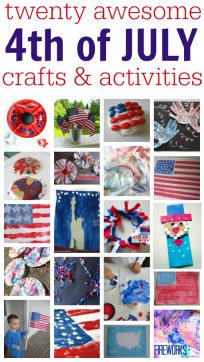 My daughter will love this craft – and the marshmallows too! Your little guy is getting so big! 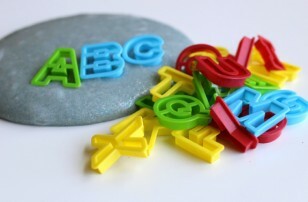 We made the “O”ctopus this week so I was looking back at your first Letter of the Weeks – he’s grown so much. I was pretty excited with how well this went too. It took us a while , I helped but he did a lot of it. I know the other day he went to a new park and climbed up all by himself, waited his turn and slid down. I was holding back the tears. Yummy! The kids are going to love this. You know whats really good is Rice Krispie Treats made with the Strawberry Marshmallows. Try it! I think my kid would beat me up for using his marshmallows this way. I, personally, LOVE the idea. He, however, LOVES his marshmallows. We’ll see how it goes. We have a Duckie book where she is looking for her ducklings, and it is one of my son’s favorites. I didn’t realize there were more. I’ll have to keep an eye out for that rainbow one. Awesome! We love to do activities with Marshmallows. 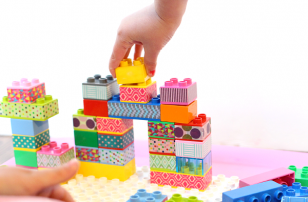 My kids are a bit older, so we are usually building structures, etc. with them. This would be fun though to do for Spring and yummy! 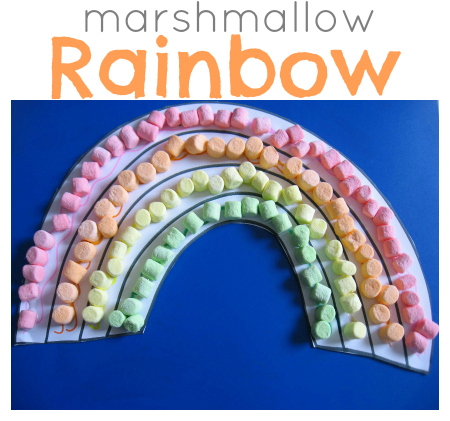 This is probably my fave craft idea so far because it combines some of my kiddos fave things: marshmallows, rainbows and glue. 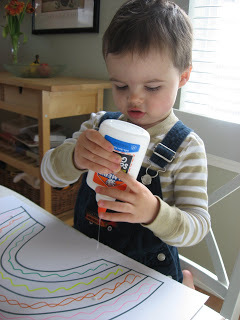 To see evidence of how much my li’l man loves glue, head over to my blog and click on the glue on a dog link under my “Best of” at the top of the left sidebar. You’ll get a chuckle! I love this!! I want to make a pot of gold at the end for St. Patrick’s Day. Thanks for the inspiration. Great minds think alike- I was going to add the pot of gold ( Wal-mart has gold coins for 1 dollar), except the rainbow took so long my little man was spent, so my tip if you have tiny ones and you want to do that , either do it on 2 days or make a smaller rainbow. I can’t wait to see yours! I love this project and all the fun extra ideas in the comments! Thanks so much for sharing, I’ll be linking. I have yet to find colored marshmallows around here but I just figured out I can use Fruity Cheerios! Yay we’ll do it today… its raining out. Really cute and simple! Maybe we’ll try to squeeze it in before St. Patrick’s Day! Attractive component of content. I simply stumbled upon your weblog and in accession capital to say that I get in fact loved account your weblog posts. Anyway I?ll be subscribing for your augment and even I achievement you access constantly quickly. I recently discovered your website and am loving it! I’ve started doing a daily activity with my 3-year-old, so I’m looking for lots of ideas. 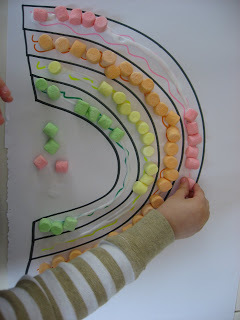 Today we did a rainbow craft based on this idea. Instead of marshmallows, we used the candy hearts we’ve been playing with for the past few days (sorting, patterning, etc). He loved it and was so proud to see it displayed at the kitchen table during dinner. Thanks for all the fantastic ideas!! I’ll be back … a lot! Thanks for sharing all your wonderful project ideas!